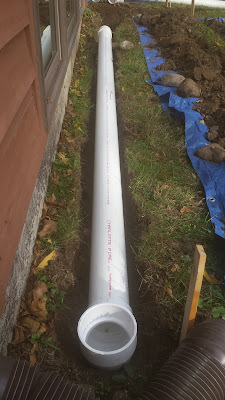 The following photo shows where the piping is now buried along the house, both downspouts (to be connected), and the beginning of digging the rain garden on the right. 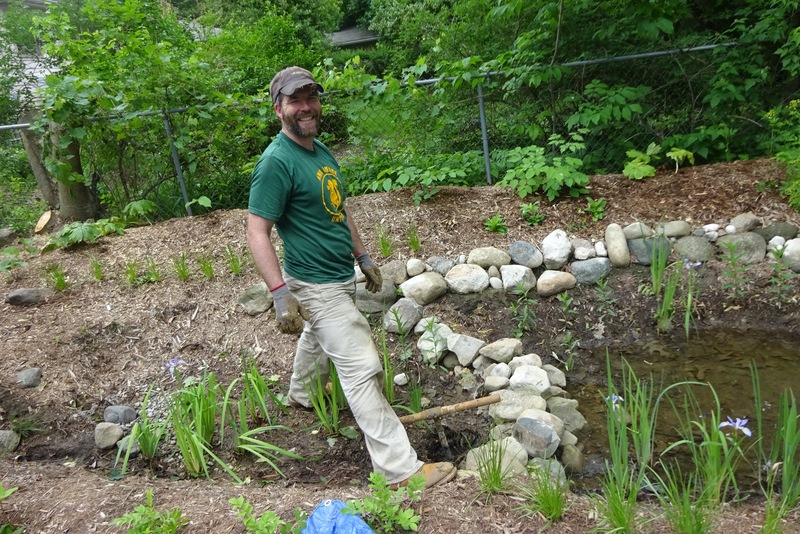 The rain garden was constructed in two tiers, an upper and a lower. Water seemed to arrive and stay standing in the lower tier...shortly after digging was completed. The new rain garden was actually a new pond! 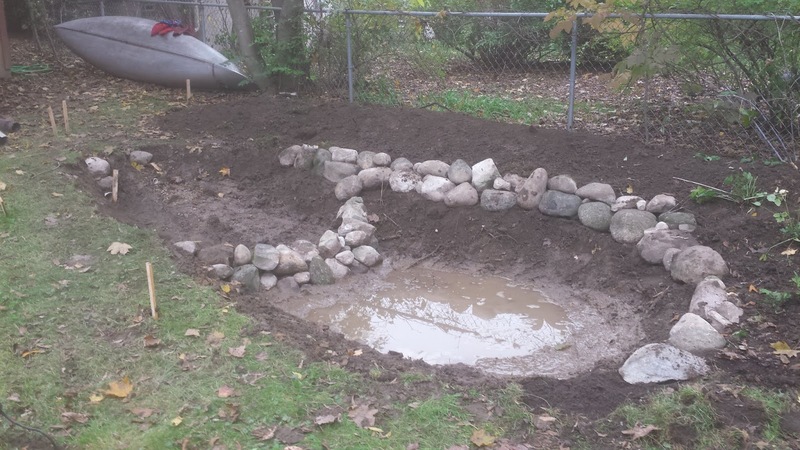 For anyone excited about a pond, please note that standing water is also known as a mosquito factory and is generally not desired when constructing a rain garden. 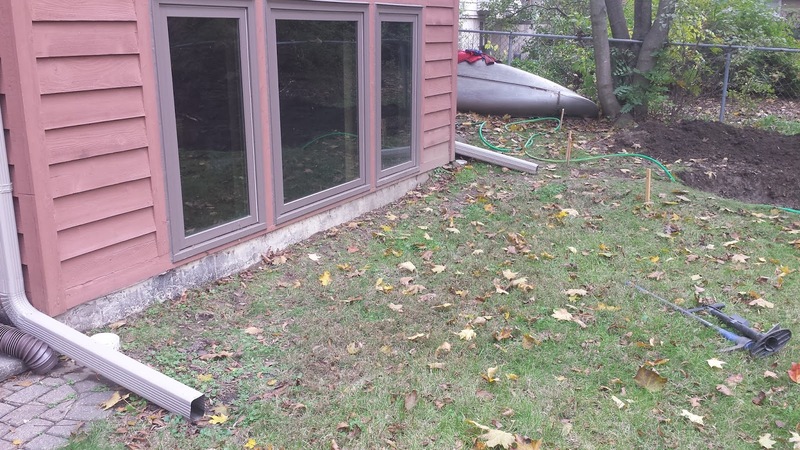 The two water sources are kind of visible on the left of the rain garden in the following photo. The furthest left pipe end is the piping from the downspouts. I was surprised to see the water table at that elevation, so I started wondering if the water was just sitting on a localized plateau layer of clay. 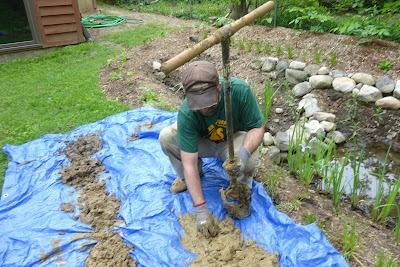 I decided to investigate via soil boring the soil underneath the rain garden...to see if soil characteristics change and at what depth. C - 33 to 79 inches: loam. I likely removed the Ap and part of the Bt1 layers when I dug out the rain garden assuming the soil profile was intact. That should be an okay assumption. The bottom of the rain garden possibly started with a clay loam layer! So, during the Spring of 2018, I rented a "soil borer" from A-1 Rental, as shown below. The tool turned out to be not so much a soil borer, but more of a post hole digger with an approximately five inch cone. The tool did allow me to bore to a depth of around three or four feet, which was desirable. However, an actual soil borer with a relatively small two inch cone would certainly have been easier to manage! Photo, below, of the hole (by my foot)...also showing the top of the soil borer tool. 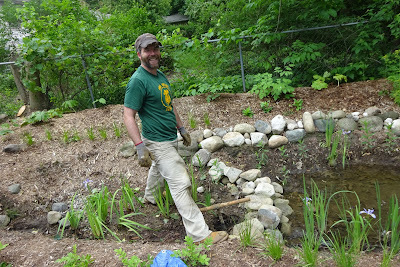 I was able to bore almost 3 feet below the bottom of the rain garden. The following photo shows the soil removed from the hole. The darker material on the left came from the top of the hole. Continuing counter clockwise around the blue tarp shows the removed material the deeper I bore. A soil scientist could probably provide a more in depth analysis. I am mostly guessing the following as I am not a soil scientist. 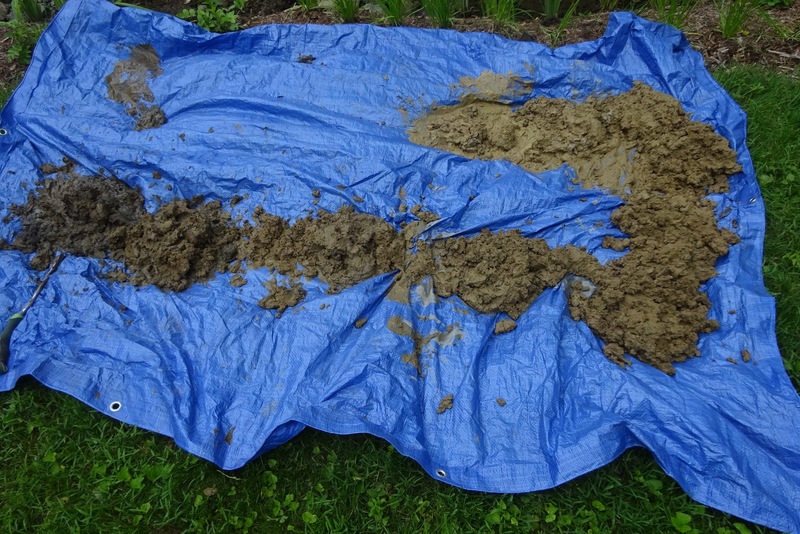 The first two piles on the tarp, the darker content which possibly indicates a higher organic content, might correspond with the Bt1 layer. Remember that I already removed the upper approximately eighteen inches of the soil profile when I dug out the rain garden. The medium brown, relatively, of the third through five-ish piles might correspond with the Bt2 layer. The last three-ish piles...the C layer. I was hoping to observe an obvious decrease in the clay content of the soil and/or an obvious increase in the sand content. Either would probably correspond with increased soil permeability. 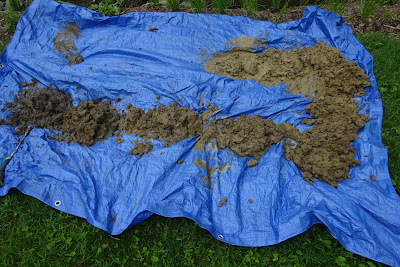 Other then the slight color change, the soil all seemed loamy. So, an "easy" fix of boring several holes down below the rain garden probably would not substantially increase infiltration. Thus, the best option to prevent standing water appears to be back filling the lower tier to an elevation at or slightly above the standing water surface. 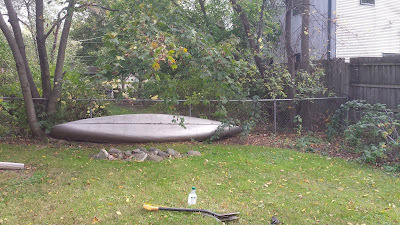 Burying the water table should hopefully prevent long-standing water. Even with back filling, there should be adequate slope for water to run downhill to the lower tier. That decision has yet to be carried out, but should be accomplished in the near future. Then again, my clients might decide they like the pond in their backyard! Who knows! NOTE: As I performed the soil bore, I observed numerous mosquito larvae swimming joyfully in the standing water. UPDATE (July 23, 2018): The pond is currently dried up probably due to the drought conditions we have been experiencing for most of this summer. So, the pond should be considered a seasonal pond. No mosquitoes currently anyways!